Cycle Chic®: No, No Not Yet! This is where we're heading but please... please not yet. Let's enjoy the crisp autumn days. Please. yikes! time to take the bus! why would you want to take the bus?! 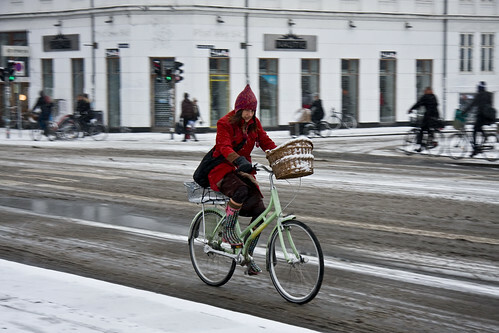 400,000 people in copenhagen continues to cycle through the winter. same thing in québec, we had snow two days ago... Please Nature mother let us enjoy autumn. Anyway, Copenhagen you rock !!!!!!! Ridding on snow, I love it !!!! Thinking seriously to come in Denmark after my Ph.D. Thank for your blog !!! Inspiring !!!! Much rather ride in snow than rain! HA! great shot! ...but yes, I'm already over the cold. They're telling me I'll get a taste of that on Friday. I like riding in the snow, but not the slushy stuff; and I think it's way, WAY too early in the year for it. I envied you in July when it was 38c where I am. I pity you now that it is 25c here and "Gawdawful" there. The part of Ontario that I live in, we generally don't see snow until mid to late November. With how cold it has been the past week though, we're not to far off from seeing the white stuff. WHAT?! Here in Portugal we have 30ºC!! There´s people on the beaches! The weather is definitely INSANE!! CPH global warming reunion is coming!!!! Obama in a bicycle?? That cyclist look like Red Riding Hood - basket and all!